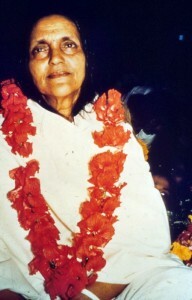 From the time when the Leela of Shree Shree Ma Anadamayee started to become well known thousands of spiritual seekers were gathering around her for spiritual instructions from all walks of life, irrespective of any particular religious adherence. During her sadhana khela (play of Sadhana) on the day of Raksha Bandhan she had self – initiation. As such she never projected herself to the world as the Guru although people at large started thinking her as such. Ma’s reply was, “Whoever amongst you says whatever, the all pervading Para Brahma (ultimate reality), paramatma (the one ultimate soul) who is called Bhagavan, He indeed is the Mother of all.” (Vangmayee Ma, Vol 1, page127, 1st edition, S S. Anandamayee Charitable Society, 1390 Bengali era) As such it was rare that she ever gave the conventional Diksha. Of course, there are a few instances when people received a mantra from her, which she never termed Diksha. When the system of Diksha started in the ashram Pitaji (Her husband, Bholanathji) was giving Diksha to seekers, in her presence. It was said that Bhaiji also gave Diksha to a few. After Pitaji’s withdrawal of his mortal frame, the conventional method of giving Diksha was no longer there. After Ma’s mother, Sreejukta Mohkshada Sundari Devi (Didima) embraced Sanyas and became known as Shree Muktananda Giriji Maharaj (or Giriji) she was giving Diksha as the Guru, mostly in presence of Ma. In the late 1950s three Brahmacharies (Br. Kusum, Br. Bharatbhai and Br Tapan) were engaged in Gayatri Purashcharan for three years. After completion of their rigorous spiritual practice they embraced Naishtik Brahmacharya and were named Br. Nirvanananda, Br. Bhaskarananda and Br. Nirmalananda respectively. After the physical withdrawal of Giriji’s mortal frame and with the approval of Ma, a special method of Diksha was adopted in the ashram. These three Naishthik Brahmacharies were named as the Acharyas (not Gurus) to conduct the process of Diksha in the presence of Ma. Those who had the chance to get initiated during Ma’s physical presence will well remember Ma’s counseling immediately before the process of initiation. I repeat the same as far as I remember. The acharyas are the representatives or the media of the Guru. If any one takes Ma as the ultimate goal and considers himself as her child he may not feel the necessity to change his viewpoint of Ma and consider her as the Guru. That too goes well with her saying above. The path of spirituality is very subjective and its uniqueness depends on the innate and inner constitution of the individual Sadhak. After Ma had left her mortal frame the same process of Diksha is continuing. Now Dikshas are given either in the Samadhi temple, or before any idol of God consecrated by Ma in different ashram temples of the Shree Shree Anandamayee Sangh.